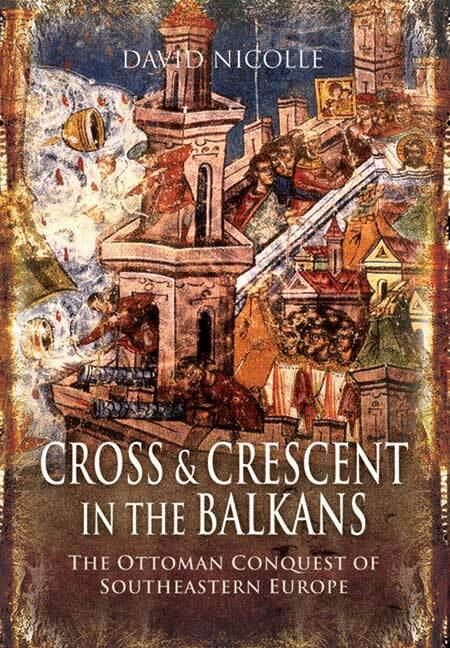 You'll be £4.99 closer to your next £10.00 credit when you purchase Cross and Crescent in the Balkans. What's this? This is not just another retelling of the Fall of Constantinople, though it does include a very fine account of that momentous event. It is the history of a quite extraordinary century and a bit which began when a tiny of force of Ottoman Turkish warriors was invited by the Christian Byzantine Emperor to cross the Dardanelles from Asia into Europe to assist him in one of the civil wars which were tearing the fast-declining Byzantine Empire apart. One hundred and eight years later the Byzantine capital of Constantinople fell to what was by then a hugely powerful and expanding empire of the Islamic Ottoman Turks, whose rulers came to see themselves as the natural and legitimate heirs of their Byzantine and indeed Roman predecessors. The book sets the scene, explains the background and tells the story, both military, political, cultural and personal, of the winners and the losers, plus those 'outsiders' who were increasingly being drawn into the dramatic story of the rise of the Ottoman Empire. This is not just a military history. Nicolle also includes large sections on Ottoman society & culture, the nature of Ottoman towns and villages and even the different styles of art. The book is structured chronologically with digressions onto other topics, so it is possible to follow the course of events, while at the same time getting n idea of the wider context. This book offers an overview of the wider historical context of the fall of the Byzantine capital. David Nicolle, who has published extensively on Medieval warfare, examines numerous aspects of this fascinating period, including artistic, literary, and social trends. It therefore serves as a useful introduction to the world in which the Ottoman Empire developed. Enthusiasts of military history will find full descriptions of the structure, tactics, and deployment of the major forces that fought for or against the emerging Ottoman threat. Religious tension inevitably played a role in the conflict between the IslamicOtoman Turks and the European states they fought. Yet, rather the a 'clash of civilisations', the author makes it clear there was a significant level of continuity between the Byzantine and Ottoman Empires. Indeed, the latter came to view themselves as the legitimate heirs of the Roman and Byzantine predecessors. The dramatic fall of Constantinople is described in full, with particular, with particular emphasis on how delays in the responses of allied European states contributed to the momentous defeat of the Byzantine forces. The author excels at describing the various stages in the siege with the pace one would expect in a thriller. Alongside the narrative, the book provides a series of maps and illustrations. A lengthy glossary is invaluable in interpreting the numerous titles and positions within Byzantine Ottoman armies; and a bibliography provides suggestions for further reading. This latest work by David Nicolle will certainly appeal to anyone with an interest in the Byzantine and Ottoman Empires, as well as Medieval warfare in general. David Nicolle is a leading expert on the history of medieval warfare, in particular the Crusades and Middle Eastern warfare, and he is a prolific writer of books on these subjects as well as articles and magazine articles. Among his many previous works are The Hundred Years War; The Mongol Warlords;Saladin and the Saracens; The Crusades; The Medieval Warfare Sourcebook; Hattin 1187 and Fighting for the Faith.